Ocala leadership decided that the Telecommunications Utility should charge the municipality the same rates that the local Regional Bell Operating Company (RBOC) had charged for a T1 line, which offers capacity of approximately 1.5 Megabits per second (Mbps). Even though utility poles belong to the city, the Ocala Fiber Network (OFN) also pays pole attachment fees to the city rather than be accused by incumbents of preferential treatment. While the city may not have cut its payments for telecommunications, it began receiving better services, reliability, and the ability to anticipate costs from year to year. Unlike obtaining services from one of the larger incumbent providers that often a community such as Ocala can enjoy budget certainty with regard to connectivity costs, when they own Internet infrastructure. Like other communities we’ve studied that have self-provisioned for an extended period of time, it’s difficult to know how much they’ve saved. Often no one keeps records of what they used to pay once they make the switch, and the high-speed connections a city has access to via a municipal network may not even have been offered from an incumbent. In the early 2000s, Arnie went through the mental exercise of trying to calculate a comparison between what the city of Ocala paid the OFN versus what they would likely pay an incumbent provider, if one offered the kind of services OFN provided. At that time, he estimated Ocala was saving up to $1 million per year, or 30 percent, on telecommunications costs. Without factoring in that a large private sector ISP would have likely raised rates considerably, Ocala has saved a minimum of $23 million on telecommunications costs. When the Ocala Telecommunications Utility was created, the city funded the deployment with a $4 million interdepartmental loan from the electric utility reserve funds; over time, they've consistently continued to expand it slowly with funds from the telecommunications division. Today, the network includes approximately 760 fiber miles. From the start, the Telecom Utility has been a division of the electric utility, and during deployment personnel from both worked alongside each other, reducing costs and enabling both divisions to be aware of happenings in each others' division. By 1997, Ocala was in a position to take advantage of continuing opportunities to grow. They connected community anchor institutions (CAIs), such as the local hospitals and their clinics. At the time, the local Internet access provider, Embarq (later CenturyTel and now CenturyLink) couldn’t or wouldn’t offer the capacity that they needed and that OFN offered. Arnie remembers that, at the time T1 service cost approximately $400 per month; the city would charge similar rates for 10 Mbps connections. Large entities and businesses were signing up. Healthcare has always had a strong presence in Ocala. Several radiologists live and work in the community and need to be able to transfer large data files from both home and clinic locations. In order to accommodate them, Ocala allowed them to lease dark fiber capacity to create their own networks between facilities for voice and data transfer. The city used its fiber in the late 1990s to connect clinics so medical professionals could share files and apps directly. Progress Telcom, which was a division of Progress Electric, offered service in the area when Ocala was developing its network. After changing hands several times, eventually the electric division was sold to Duke Energy and Level 3 purchased the telecom division. Years before the transition, Ocala had built special lines for Progress Telecom. Over the years, they've continued that arrangement by leasing dark fiber to Level 3. Ocala used its network to supply fast, affordable, reliable connectivity to a business incubator called the Power Plant, located downtown. The facility, which began in 2012, began as one building which was a renovated electric utility facility, but within ten months of opening, the small and emerging companies using the tech-centered facility had filled the space. The community received U.S.D.A. Rural Development funds to pay for the expansion to two more nearby buildings. With OFN providing Internet access at affordable rates and an office environment, entrepreneurs continue to use the space as a location to work, meet clients, and be in a productive space with colleagues. In 2011, the city commissioned a feasibility study to investigate other ways to use the fiber network, including the possibility of expanding to residents. Consultants recommended the city continue to grow the network, focusing on commercial areas where larger employers are located and in areas where new employers might want to establish business, such as industrial parks. At the time, the consultants also discovered approximately 20 locations, such as office buildings, commercial properties, and medical centers, that could be connected to the fiber network with only about 5.5 miles of fiber deployment. The feasibility study also recommended the city use the network to create an opportunity for competition by offering the fiber for lease. Consultants homed in specifically on niche network services that smaller providers would like to provide, but needed infrastructure on which to operate. Privately owned fiber networks were not open to these specialty providers, reasoned the consultants, but the Ocala infrastructure could offer services that would attract businesses. The city had connected a small number of residential premises and, even though the consultants praised Ocala for their vision, they also noted that it would involve substantial investment in equipment and in staff resources to pursue a community-wide deployment. Nevertheless, the consultants who developed the feasibility study noted that local communities that invest in Fiber-to-the-Home (FTTH) typically find the benefits more than outpace the cost. Arnie recalls that the telecom division had to endure numerous squabbles that involved political decisions and philosophical opinions about competing with the private sector. In the early days, the division was reselling dial-up service from GatorNet, the Internet access provided by the community of Gainesville, located near Ocala. GatorNet had originally been established by the University of Florida. The Ocala City Council at the time didn’t want the municipal utility competing with the local private sector, so instructed the telecom division to sell off the service. “We had a city council that thought we shouldn’t be in this business,” says Arnie. Over time, the city council changed and so did their perspective. Today, they offer several services for local businesses, including dark fiber, colocation services, and dedicated Internet service. Companies subscribing to OFN can also subscribe for a metro area network (MAN) in which their own facilities are connected directly to each other. OFN offers businesses four standard shared Internet access tiers and has worked with companies that require specialized services. Arnie describes the city’s residential fiber undertaking as beginning on a case-by-case basis and slowly growing. The utility continued to connect businesses and, when a business needed fiber connectivity to a home office, the telecom division obliged as long as the business paid for the cost of the connection to the home. The utility continued to invest only in similar small deployments from around 2004 through 2012. The first home to receive fiber connectivity was the IP Director for a radiology clinic. He needed the connection to keep the clinic operating smoothly 24/7. Word got out and the utility connected doctors from the same clinic and other facilities who each needed high-quality connections in order to work at home. Since those days, they’ve connected homes of people from all types of industries. Before the city could take FTTH to a wider range of households, the Florida Legislature passed state law that imposed significant requirements to discourage municipalities from offering services to the public via their infrastructure. Since Ocala had already been offering data, they were grandfathered in and able to continue as before, but the change impacted their decision making as they moved forward. Now, OFN offers one tier to residential premises — symmetrical 300 Mbps for $60 per month. In 2012, the city council imposed a moratorium on residential deployment to allow the utility to catch up with the waiting list generated from intense demand. The network had become somewhat fragmented because the approximately 200 residential customers on the network were geographically spread out through Ocala. Engineers and city leaders knew that they wanted to eventually connect every property in Ocala, but wanted to find an efficient way to continue the deployment. That moratorium is no longer in effect and engineers are taking a different approach. Moving forward, residential builds will be deployed with GPON, rather than Metro Ethernet, which is the technology Ocala has used in the past. As they build out, engineers will deploy in neighborhoods that achieve a 30 percent pre-signup rate. Arnie says that their prior method of design resulted in “too much fiber on the poles.” Approximately 2/3rd of the current network is aerial. The city is not actively marketing for residential subscribers yet, but they have decided to focus on four specific neighborhoods where they will begin connecting additional residences. In order to determine which neighborhood will be the first to get residential FTTH, they’ve asked interested homeowners to sign-up online to show interest. The city also began offering dark fiber and other services to Marion County facilities. The OFN has, over the years, added “pretty much all of the county agencies” says Arnie. Marion County, located within the northern half of the state has approximately 60 agency facilities. The city of Ocala and its electric utility has Competitive Local Exchange Carrier (CLEC) status and is able to offer better rates and services than incumbents Cox and CenturyLink. All of the city’s electric meters — approximately 58,000 of them — are read automatically, as are the city’s 60,000+ water meters. All of Ocala’s 129 traffic control signals are connected to an intelligent transportation system via Ocala fiber. All parks and recreational facilities in the city have public Wi-Fi, including their farmers’ market space. A few less than 100 public safety cameras are speckled throughout the city. Ocala is using the network to make use of smart city apps such as real time parking and enforcement. Parkers can pay their fees with smartphones and city staff knows when cars have been parked in a space too long through the network. Every middle school and high school in Ocala has ten gigabit connections and a dark fiber connection to their disaster recovery (DR) site where they use a 40 gigabit connection. Arnie says they’d like to supply 120 gigabits to the school district, but the equipment at the school facilities doesn't have the ability to function at such high capacity. The school district recently switched from a one gigabit connection with CenturyLink to the OFN, who deployed approximately 80 miles of fiber to connect the schools and their DR site. Ocala is the county seat of Marion County and home to approximately 59,000 people. Located in the north central area of the state, the city has been known for its strong thoroughbred horse-breeding industry since the 1940s. The city has taken steps to preserve its historic architecture, much of it dedicated to the Victorian style. The College of Central Florida is also located in Ocala and the Marion County Library System maintains three of its libraries in the city. Several other colleges have campuses in Ocala. Some of the largest employers in Ocala are the county public school system, the Munroe Regional Medical Center, and the State of Florida — all entities that require high capacity connections. The community has developed a short promotional video that shows off the natural and manmade beauty of the area as well as the opportunities and how people are taking advantage of them. 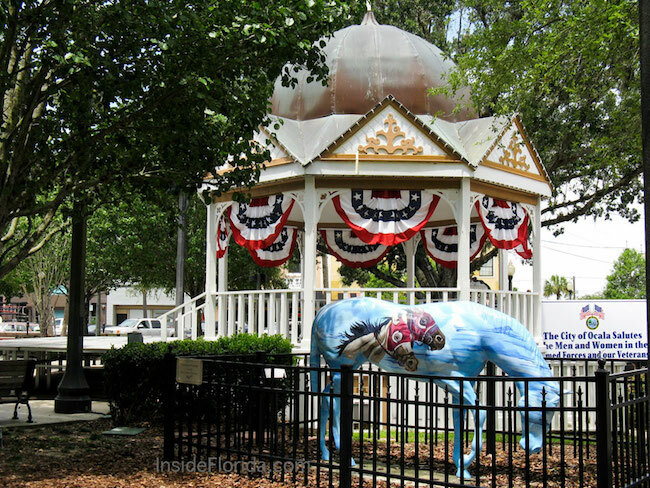 Photo of the Ocala Gazebo and horse sculpture courtesy of Inside Florida.